← A Hat Trick on Amazon! As I’ve just had three stage plays made available on Amazon I thought it was time to share how I write plays – and indeed most things, including this blog. Quite simply, I use Scrivener. It’s the writing tool I reach for whenever I get an idea. It enables me to do the initial work of jotting down rough plot ideas, adding characters and putting them in the right settings. The beauty of it is, unlike ordinary word processing documents, it has everything there in one program – an easy-to-use binder containing research notes, character profiles and possible plot lines. So if I’m looking for anything – a character profile, images of the setting, a piece of research or simply an inspirational photo or quote – it’s all just one mouse click away. Once I have an idea for a play I jot down a simple plot line and then begin to populate it with characters. I try to keep my casts small, mainly because I write them to be staged initially by Newport Playgoers, the amateur company that owns and runs the 400-seat Dolman Theatre. Playgoers put on eight productions a year – so there’s often one play running and two or three others in rehearsal. As a result, the pool of available actors is a small one. Having said that my latest play has ten characters – the most I’ve ever put in a play. In the second half they are all on stage at the same time which was was fun – but also hard work trying to make sure everyone had a chance to speak and get in on the action. Which brings me to another great thing about Scrivener. Once I have my characters, I enter their names in the project’s auto-complete box. So, all I have to do is type the first letter and hey presto the name appears exactly as I want it complete with colon. For me, once I have an idea of the story, character comes first – characters are where the plot springs from – so I spend a long time working on this aspect of a play. I tend to give them the first name that springs into my head (often changed later). I use photos that I think capture the way a character looks and sounds. I build up their profile – likes, dislikes, biography, secrets, what they want – and, most importantly, what’s stopping them from getting what they want. Often ideas for the plot will spring from these notes. Scrivener proves invaluable here. I’ve created a template for stage plays which includes a folder for characters. It’s easy to add a character, name them and then drag in a photo of how I think they look. Next I use a character sheet to put flesh on the character. This method worked particularly well for the first play I had published, ‘According to Claudia’, a family drama set in the faded grandeur of the home of an elderly Oxford don. The plot revolved around this rather irascible man and his relationship with various family members as his 80th birthday approaches. I gave him an eccentric sister, a spinster whose hobbies are painting and astrology. Plenty of scope there for petty squabbling. His four offspring and their very different personalities, lifestyles and choice of partners enabled me to set up all the conflict I needed to power the plot along. I decided early on that two of the most important characters would not be seen – the don’s late wife whose sad life haunts them all, and his son with whom he has fallen out. Plot lines jotted down as I create the characters. 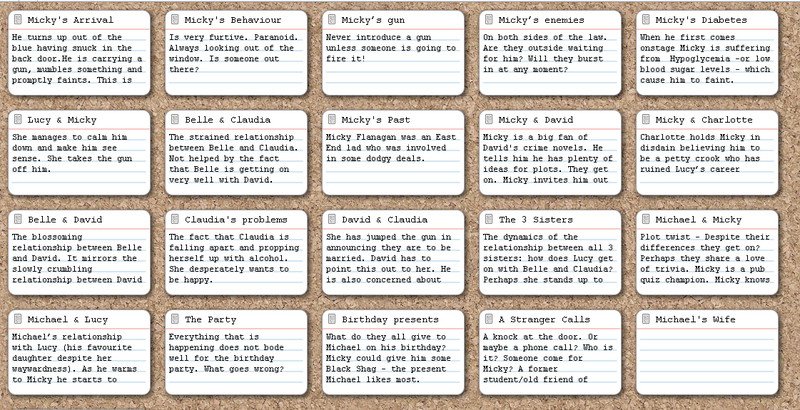 Even as I create characters in Scrivener I can “hear” them talking and bursts of dialogue will form which I write down. The characters help shape the plot. So Claudia turns up with her latest flame – a successful crime writer obviously more at home in his fictional world than the real one. 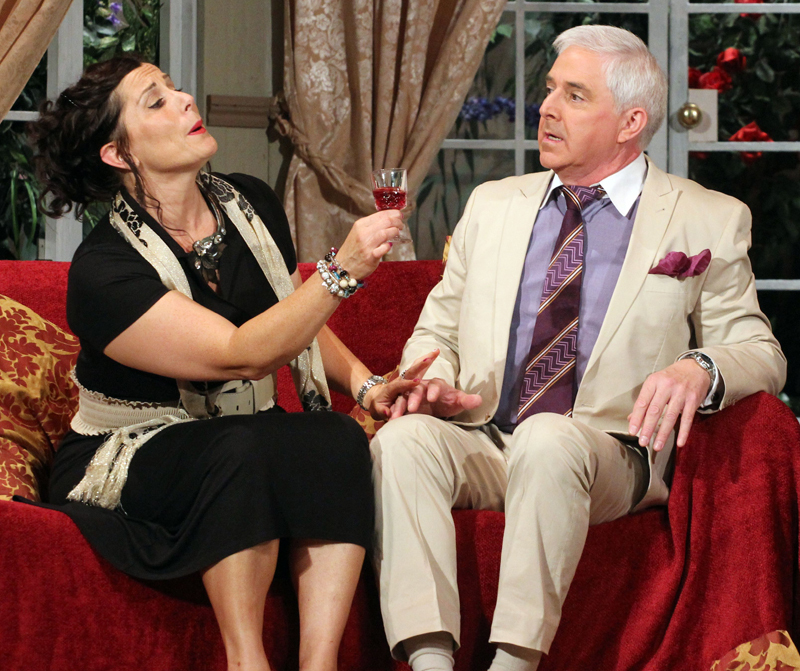 Eloise Rossiter as Lucy and Paul Howells as her husband Micky. I decide to have her younger sister come with her husband, a reformed crook who is trying to better himself. And already, the scene is being set for clashes of personality and unlikely alliances. 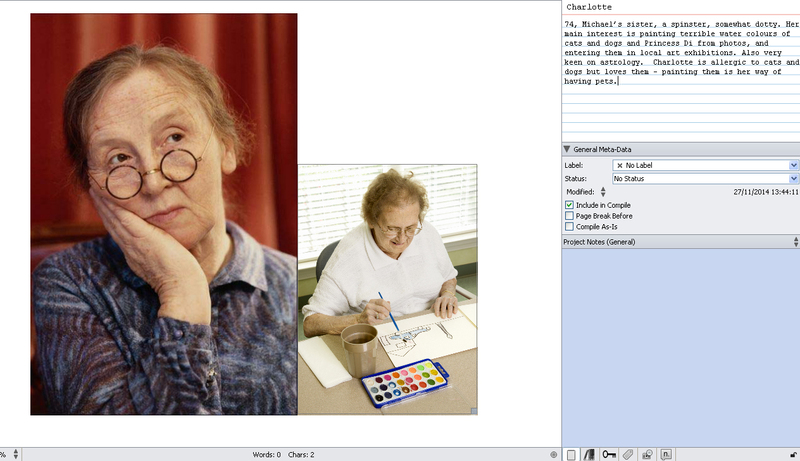 I hope this brief guide to how I use Scrivener for character creation proves useful. You can download a free trial version at Literature and Latte. If anyone’s interested in checking out the plays I’ve had published by Silvermoon simply click here to go the page where they’re listed on Amazon. This entry was posted in Uncategorized and tagged According To Claudia, amateur theatre, Amazon, amdram, Award-winner, Bunkered by Phil Mansell, creating characters, Dolman Theatre, drama, new writing, Newport Playgoers, Phil Mansell, playwright, plot, Poor Yorick by Phil Mansell, script, Scrivener, Silvermoon Publishing, stage play, Studio theatre, the stage, writing and re-writing, writing tips. Bookmark the permalink.